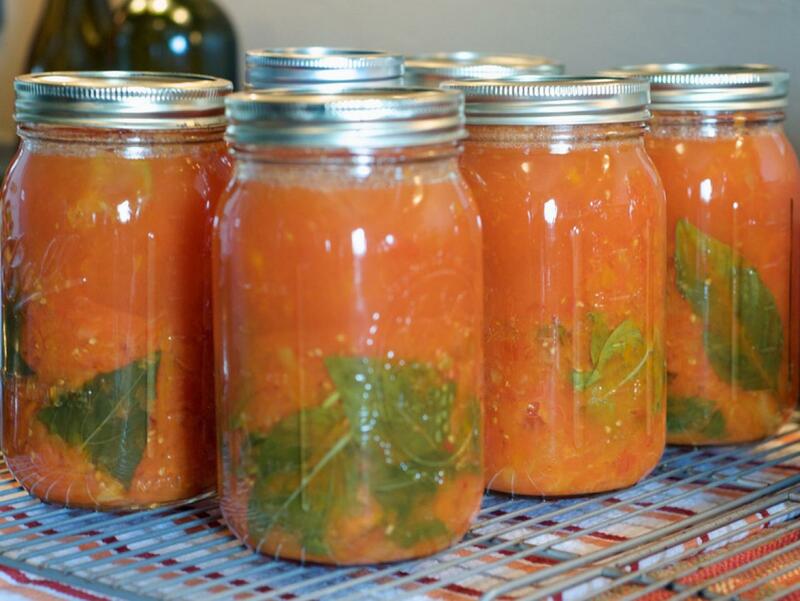 Capture a taste of summer with this step-by-step tomato canning how-to. Freshly canned tomato sauce is a taste of summer that will last all year. As summer's heat wanes, farms and gardens bring in the yearly bounty of tomatoes. When tomatoes peak, their abundance can be overwhelming, so preserving them is an excellent way to enjoy their bright flavor throughout the year. For best results, you'll want tomatoes with a high amount of meat, such as plum or San Marzano, and you'll want them just ripe. Discard any bruised or overripe fruit or extremely under-ripe fruit. In addition, you'll need some equipment. 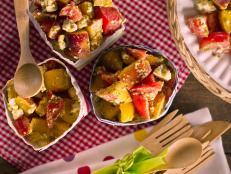 For approximately 20-22 pounds of tomatoes, you'll need seven quart-size mason jars with rings and new, unused lids; a ladle; a wide-mouth funnel; a pair of jar tongs; and a couple cooling racks set over towels. 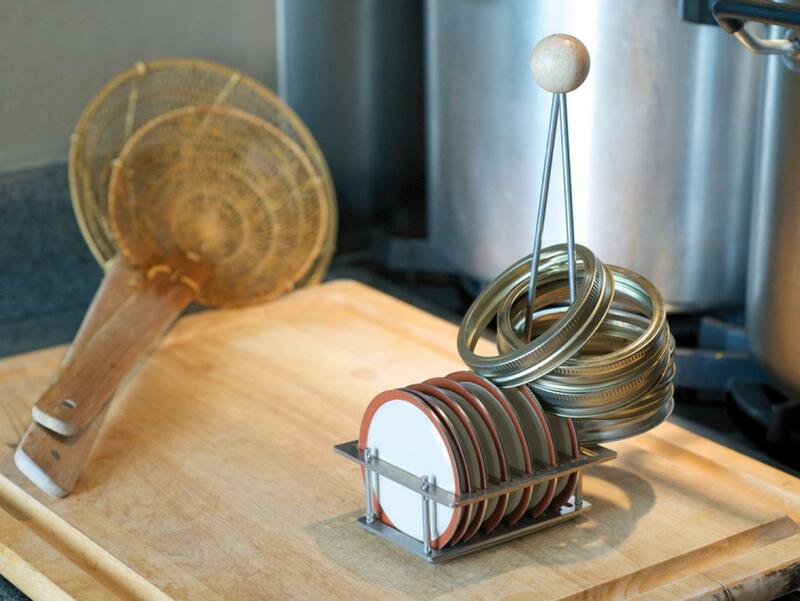 You'll also want a pressure canner. Unlike pickles and most fruit preserves, tomatoes are comparatively low in acidity, and so must be acidified in order to be canned using the standard water-bath method. Foods with a pH higher than 4.6 can harbor botulism bacteria spores; tomatoes are generally right around 4.5, so you're playing with fire if you do not bring the acid level up. 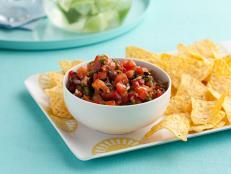 Moreover, if you add anything to your tomatoes, such as onions, garlic or basil, you are lowering the acidity further. Water boils at 212ºF at sea level; this is not sufficient to kill off the botulism spores. By raising the pressure in the cooking environment, you raise the temperature at which water boils. 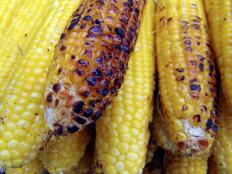 By raising the pressure to 11 pounds, you raise the boiling temperature to about 240ºF, which will kill off the spores. So, if you intend to do much canning of low-acid foods such as tomatoes, stocks or meats, you may want to invest in a pressure canner. Modern pressure canners are easy and exceedingly safe to use, and you will be able to rest easy knowing that your canned goods are free of toxins. Coring the tomato; follow up by scoring the bottom. 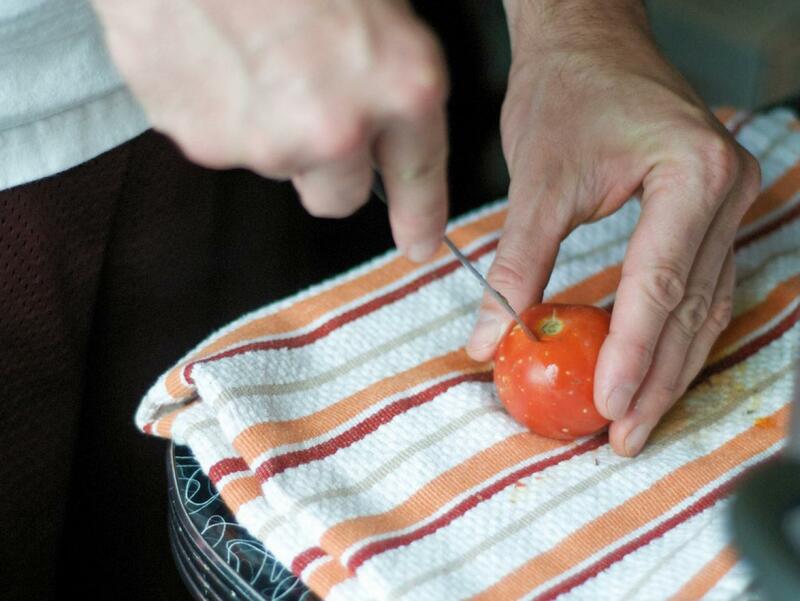 Using a small paring knife, cut out the tough core of the tomato, then score the bottom. Set a large pot of water to boil; keep a cooler full of ice water nearby. Submerge the tomatoes in boiling water for 20 to 30 seconds, until the skins wrinkle and split. Remove them to the ice water. Depending on how many tomatoes you are processing, you may need several changes of ice water, as the hot tomatoes will quickly melt the ice. Set up a workstation with three positions: A large bowl or pot, another large bowl or pot with a sieve over it, and a pot large enough to capture the tomato pulp for cooking. Remove each tomato from the ice bath. Peel the skin away and cast that into the first bowl or pot. Over the sieve in the second bowl or pot, tear open the tomatoes and remove the seeds and liquid from the chambers. Move to the third pot and crush the tomato pulp with your hands in it. This is where it will be most apparent whether tomatoes are too under-ripe, as the skins will not want to come away, and the fruit will be too hard to open and crush. Using a spatula, massage the seeds in the sieve to extract the water. 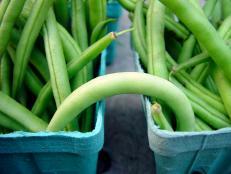 The seeds will retain some gelatinous exterior. Discard the skins and seeds, reserving the tomato water. This can be used much in the same way as a stock, e.g., a base for soups or braises, and is very flavorful. Alternatives: For a puree, place tomato pulp into a food mill over the third pot, and puree it into the pot. For tomato juice, place skinned tomatoes (with seeds) into a food mill over the third pot (no second pot necessary in this case) and puree. Place the pots of your crushed tomatoes (or puree) and water on the stove. Bring to a low boil and reduce heat. Simmer the crushed tomatoes until they break down. Meanwhile, have your pressure canner filled to the 3-quart line and over a high flame. The right tool for the job: A lid caddy helps organize and sterilize lids and rings. When the water in the canner is at least 180ºF but not quite boiling, submerge your jars, lids, rings, funnel, ladle and jar tongs (a lid caddy is a handy tool for this). If you are preparing a large number of jars, you can run them through the dishwasher (provided it sterilizes), then keep in a 220ºF oven until ready. Keep everything hot until just before you're ready to can. Remove as many jars, lids, etc., as you will can at once (a 23-quart canner can handle seven quart jars). Stuff a sprig of basil into each jar, if desired. Ladle the tomatoes through the wide-mouth funnel into each jar, leaving about 1/2" headroom at the top. Insert a clean spatula, knife or chopstick, and "bubble" the contents, wiggling it around the perimeter to dislodge any air bubbles. Using a wet paper towel, wipe the rims of the jars clean, then set the lids on top. Apply the rings, screwing on until just finger-tight. 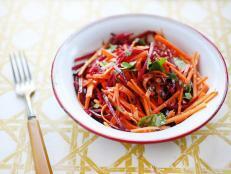 Using the tongs, lower the jars into the canner and close the lid. Keep over high heat until steam flows freely through the vent at the top; continue venting for 10 minutes, then apply the valve. Keep over high heat, monitoring the pressure. When the pressure hits 11 pounds, reduce the heat to low and set the timer for 15 minutes. Keep an eye on the pressure: It can go over 11 pounds, but it's best to keep the pressure as stable as possible. Moreover, if it dips below 11 pounds, it must be brought back up, and the 15 minutes started again. When the 15 minutes are up, kill the heat and allow to cool naturally. When the pressure has fallen completely and the cover lock drops, open the canner and remove the cans with your tongs to the cooling racks. Once cool, several hours later, test the jars by removing the rings and lifting the jars by the lids. If the lids give, the seal did not set. These may be refrigerated and used right away, or the tomatoes can be reprocessed and canned using the above instructions. Some separation may occur as the jars cool, especially for the tomato water; this is normal. Puree may retain its emulsion better. Sean Timberlake is a professional writer, amateur foodie, avid traveler and all-around bon vivant. He is the founder of Punk Domestics, a content and community site for DIY food enthusiasts, and has penned the blog Hedonia since 2006. He lives in San Francisco with his husband, DPaul Brown, and their hyperactive terrier, Reese. 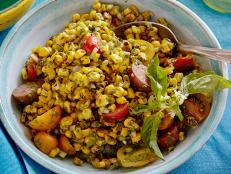 Feast on sweet summer corn, fresh from the farm stand. 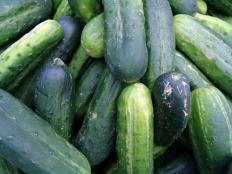 Savor summer produce like fresh cukes and zukes, fresh from the farm stand. 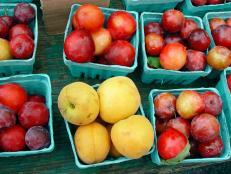 Savor juicy stone fruits—including cherries, plums, apricots, nectarines and peaches—fresh from the farm stand. 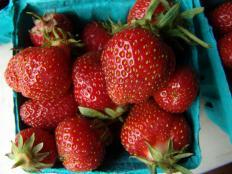 Find great berry recipes from Cooking Channel chefs. 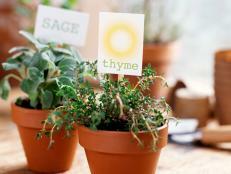 Enhance your cooking with the flavors of fresh, fragrant herbs.